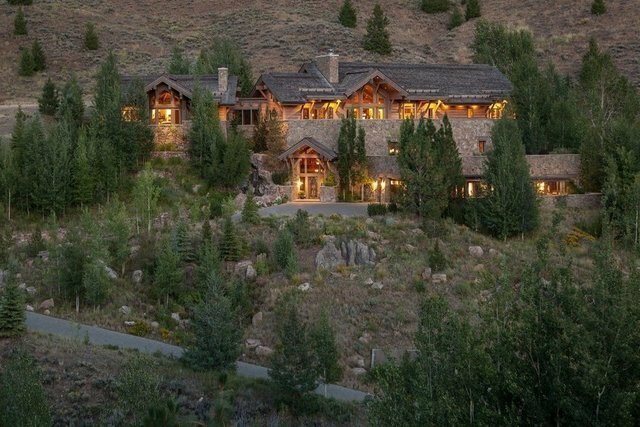 Located in Bigwood’s prestigious north end, just minutes from Sun Valley Resort and downtown Ketchum, this luxurious mountain estate property is in a league of its own. The elevated hillside setting creates panoramic views of the surrounding mountains and comes with a profound sense of privacy afforded by its four-plus acre setting and surrounding open space. Outdoor space is plentiful with generously sized west facing patios and decks that are accessible from every room. The private backyard has just undergone a substantial makeover and perfectly blends patio areas, lawn, and gardens that bloom continually throughout the summer. A dramatic rock waterfall flows from the backyard, under the house, and cascades down to the entry. No expense was spared in the design, construction, and thoughtfully proportioned spaces in the home. Details include hand plastered walls, reclaimed oak flooring, beamed ceilings, and extensive use of rock and stone. Features include a nine-car garage, separate caretakers or guest living quarters, wine cellar, spa area, rec room, and elevator. This crown jewel of Sun Valley represents a once in a lifetime opportunity to own a legacy home unlike any other. Owner in residents, please do not disturb.